Fiction – paperback; Penguin; 272 pages; 2014. 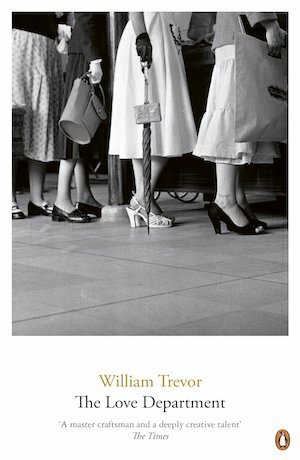 As you may have noticed, I’ve been reading a lot of William Trevor’s novels lately — and here’s another one. Lady Dolores, a ferociously over-the-top agony aunt in charge of the “Love Department” at a national publication, who hires Edward to find Septimus in order to stop more lovelorn women falling under his spell. The narrative, which moves along at a cracking pace, charts Edward’s often farcical attempts to find his quarry. A nervous, anxious type, he’d much prefer to sit in the office and answer letters from readers, but Lady Dolores refuses to let him pen a word: she wants him out on the street doing old-fashioned detective work to track down the scheming Lothario breaking hearts and ripping off women in the suburbs. It’s told in a dry, detached manner that only makes the humour — and the dialogue — more pronounced. The Love Department is essentially a farce filled with uproariously funny moments — there’s one scene involving a pet monkey running amok at a dinner party that had me in stitches — but this is a William Trevor novel, so it’s tempered by pathos and there’s a rich vein of social commentary lying just beneath the surface, too, which examines loneliness, heartache and melancholia. It’s a very fine — and darkly comic — read, one that has proved to be my favourite of his first three novels. This is my 13th book for #TBR40. I bought it second-hand several years ago (as part of a trilogy of Trevor’s early novels). You can read all my other reviews of his work on my William Trevor page. Wow! Would you say you liked it more than The Boarding House? This was the third Trevor book at my local library and one which I hope to read soon. ‘Mrs Eckdorff’ was the other one—I think you’ll like that one as well. Oh yes… I think this one is more fun… it’s a real farce… would make a wonderful movie! I really want to read Mrs Eckdorff, it sounds rather wonderful. I do hope to continue to make my way through his back catalogue, but it might take me a few years! Yes, same here. I read some of his short stories at the end of last year but didn’t blog about them. I’ve preferred his novels so far. I have a beautiful two-volume set of his short stories given to me for Christmas many years ago but have never even taken them out of the slipcase 😱 Need to rectify that at some point. Also bought his last story collection, published last year, but haven’t read that either. Too many books, not enough time. Oh, I really want to read this! It sounds such fun, perfect for a stage adaptation. I like the way William Trevor combines humour with poignancy – the tragedy alongside the comedy is beautifully judged. Oh it’s wonderful, Jacqui. I really loved this one. I reckon it’d make a great movie, it’s got so many funny set pieces in it.